This press release was provided by the office of Secretary of State Kim Wyman. 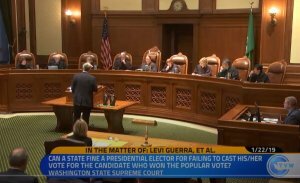 The Washington State Supreme Court’s decision to reverse Thurston County Superior Court Judge James Dixon’s ruling on Initiative 1639 means the initiative will go before voters this November. Secretary of State Kim Wyman had certified I-1639 to appear on the ballots because it met the qualifications the Legislature has empowered the Secretary to enforce, including having the number of submitted signatures and containing certain language on each petition. However, Secretary Wyman also expressed significant concerns over the formatting of the petitions. Judge Dixon’s ruling had agreed with those concerns. He faulted the formatting as well, saying that it meant the petition sheets failed to include the “readable, full, true, and correct copy of the proposed measure” required under RCW 29A.72.100. Secretary Wyman thanked the Court for issuing a quick order in the case.